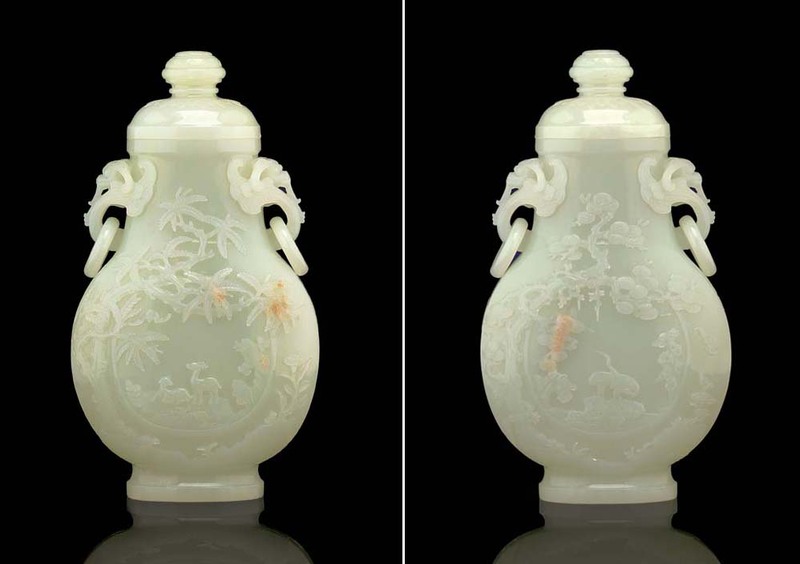 This vase belongs to a group of exceptional white jade vessels of similar size and carved in matching style. The closest comparison from this group is an example in the Beijing Palace Museum, also carved with deer and cranes, illustrated in Zhongguo Yuqi Quanji, vol. 6, p. 134, no. 208 (see fig. 1); and another similar piece with quails was exhibited at the Victoria and Albert Museum, London, in 1975, Chinese Jade Throughout the Ages, The Oriental Ceramic Society, illustrated in the Catalogue, no. 424. Both the deer and the crane are symbols of longevity, as they are often depicted accompanying the Daoist god of longevity, Shoulao.